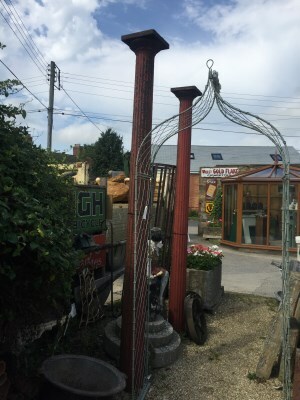 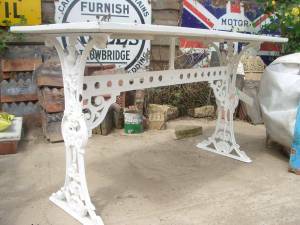 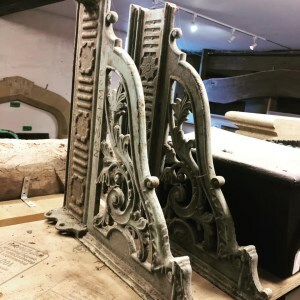 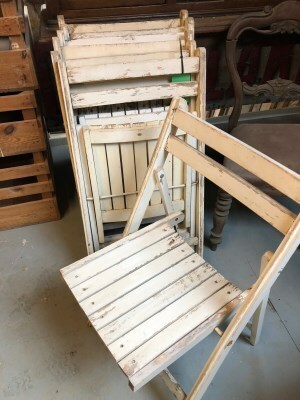 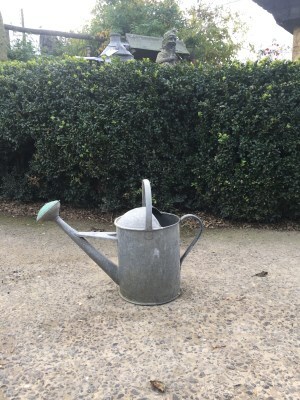 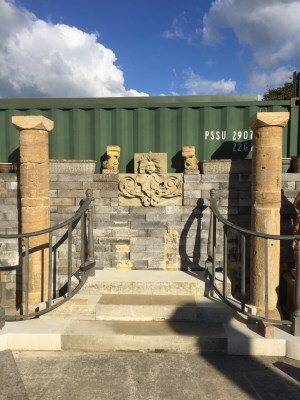 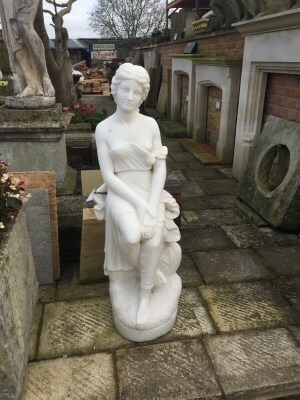 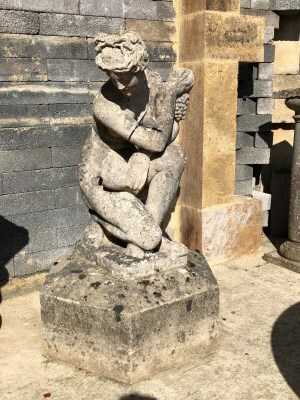 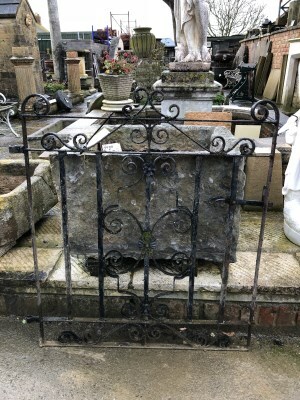 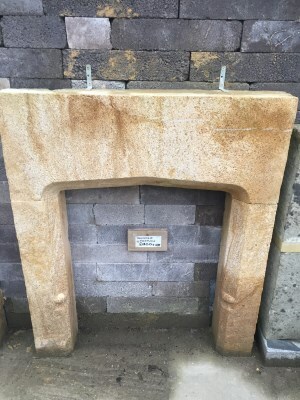 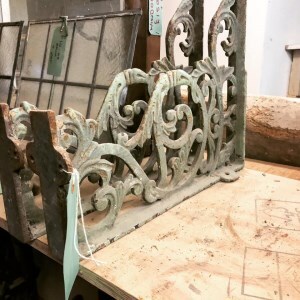 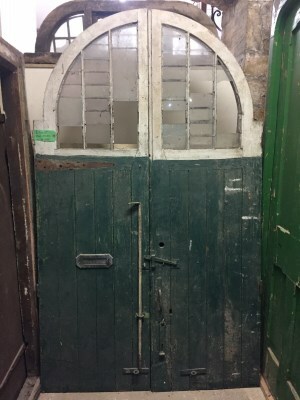 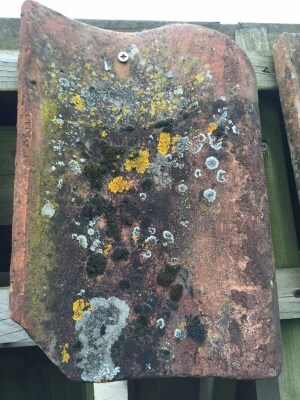 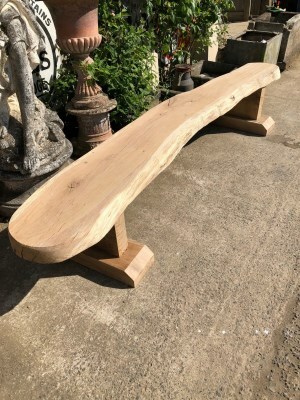 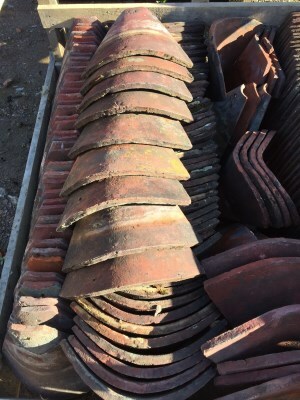 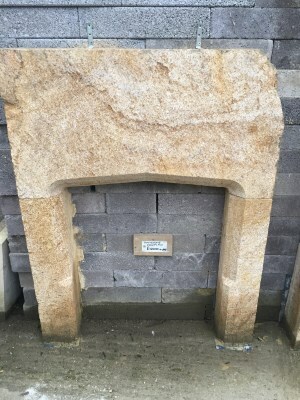 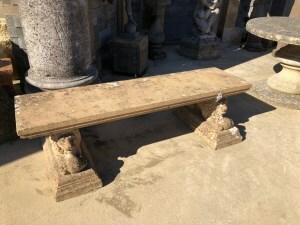 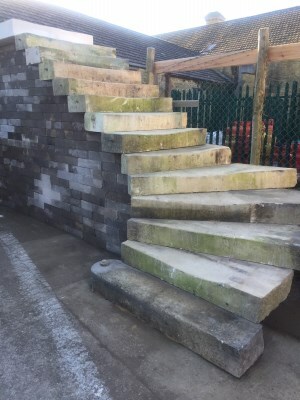 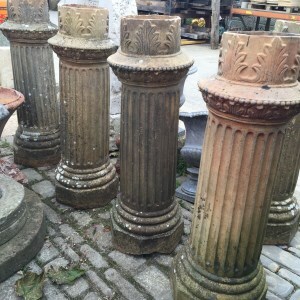 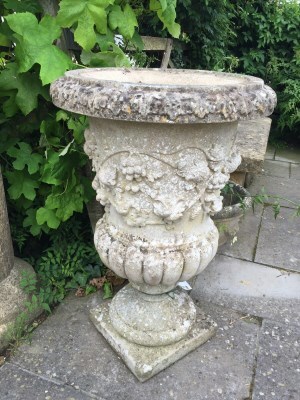 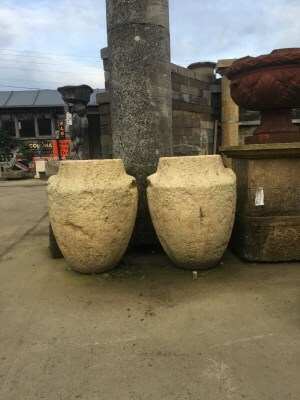 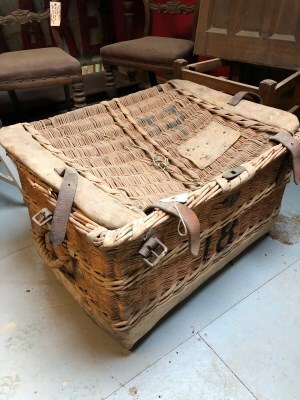 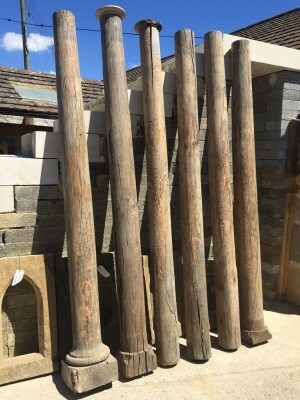 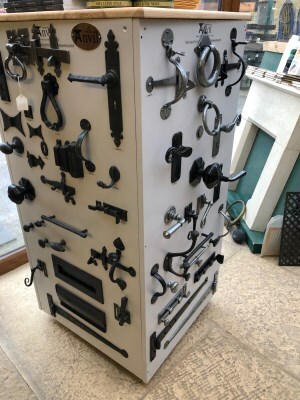 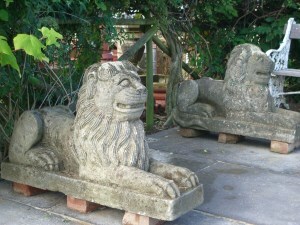 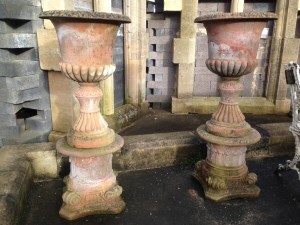 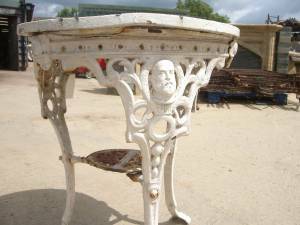 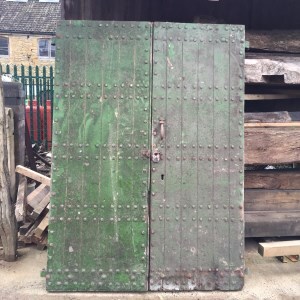 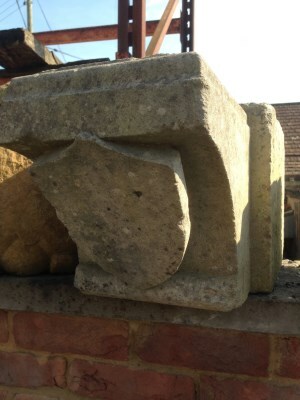 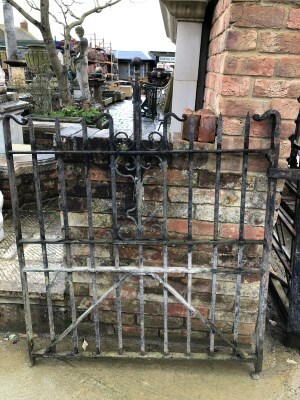 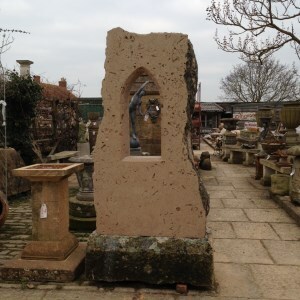 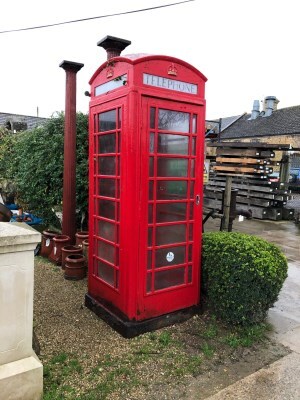 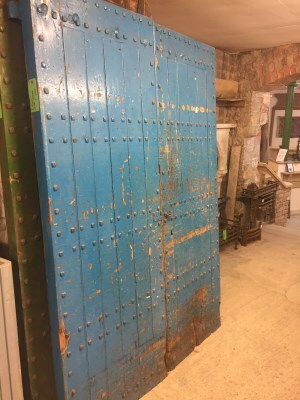 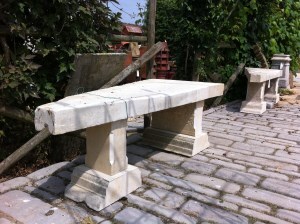 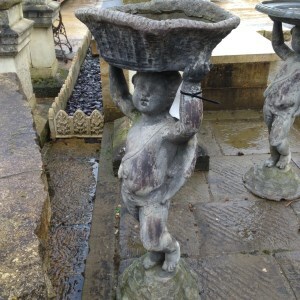 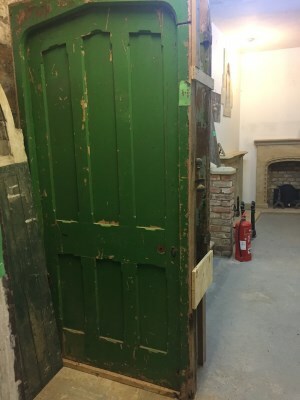 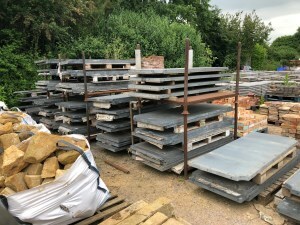 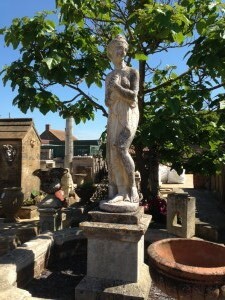 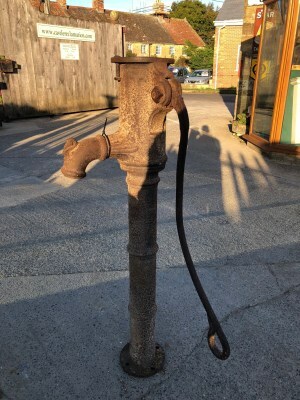 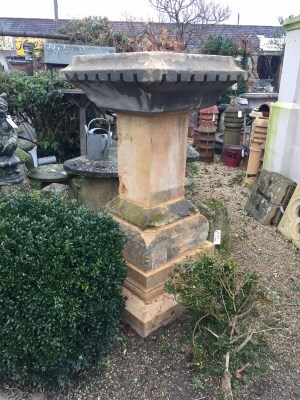 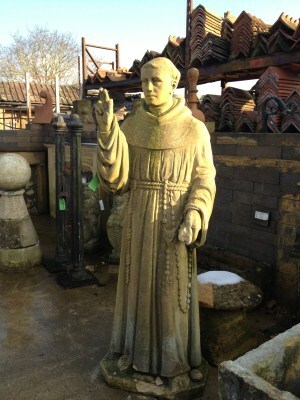 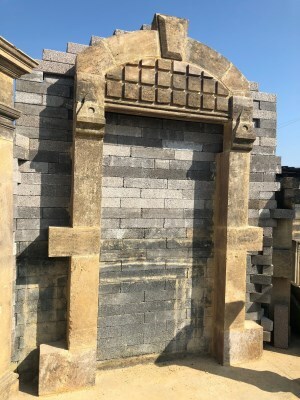 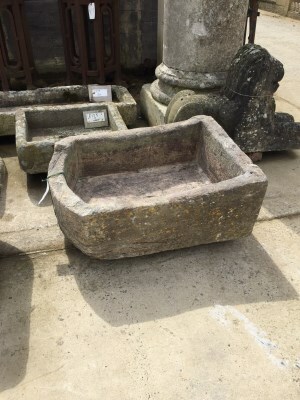 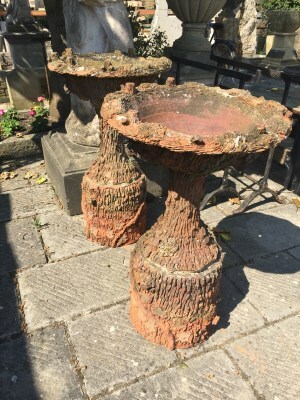 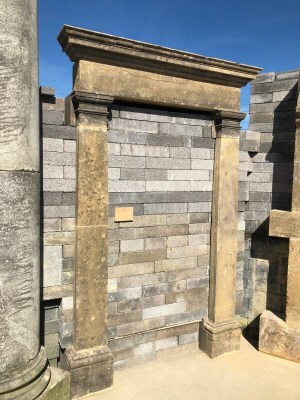 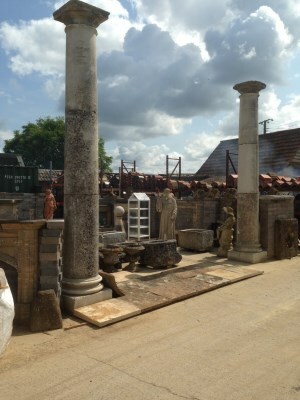 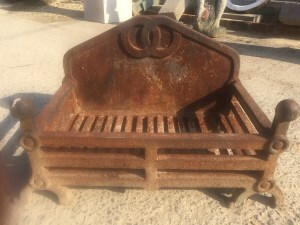 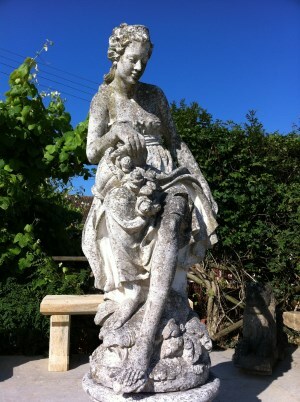 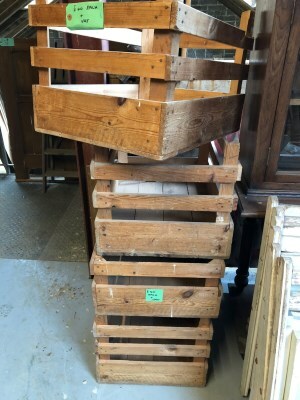 At Castle Reclamation we have a vast selection of architectural salvage and at our yard a garden area has been set, so you can view all these pieces in their full glory. 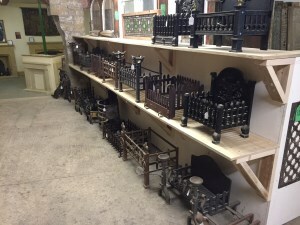 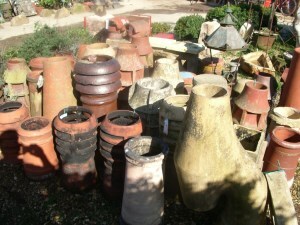 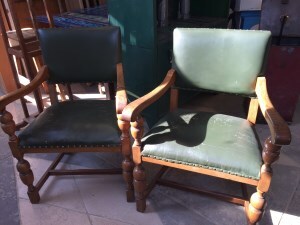 Below is a selection of our existing stock. 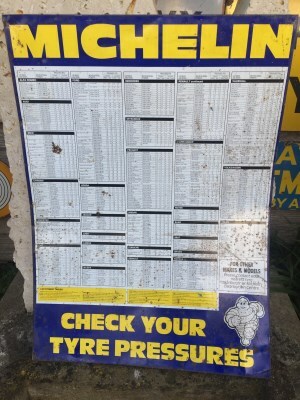 All prices are excluding vat. 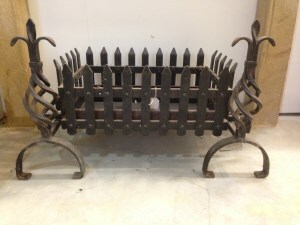 A forged fire basket 27" overall width with a basket size 20" x 10"
One of a set of two stone corbels with carved half shields 24" x 12" x 12"
A wrought iron fire basket with twisted fire dogs, The overall width is 28" with a basket 17" x 11"
An unusual shaped Hamstone trough 43" x 22" x 12"
Portland stone "Kingsbere" style fireplace 55" wide x 45" high with an opening 33" x 33"
One of a set of five stone corbels with carved shields 24" x 12" x 12"
A Michelin tyre pressure sign that would grace anyone's garage wall. 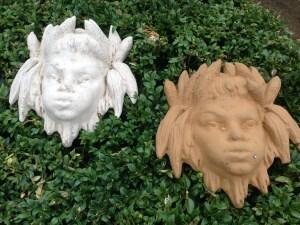 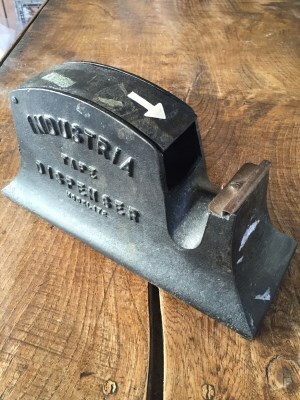 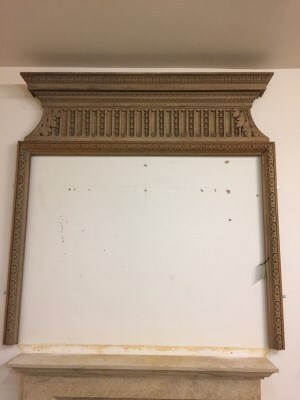 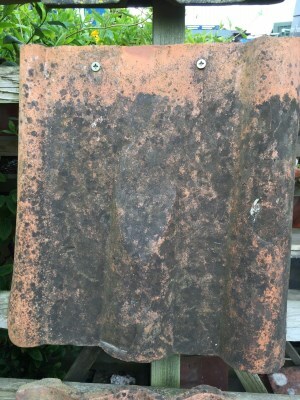 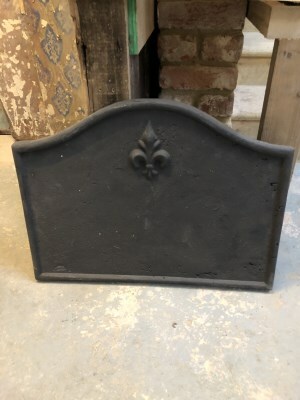 34" x 24"
A pair of large cast iron brackets 16" x 16"
Cherub wall masks can be supplied in Hamstone, Purbeck or Blue Lias colours. 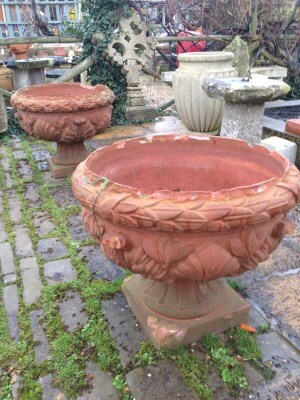 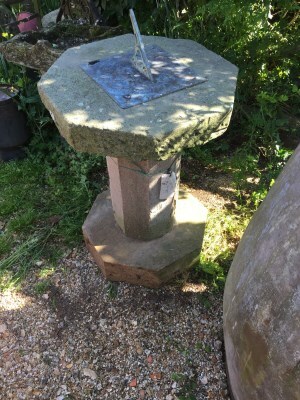 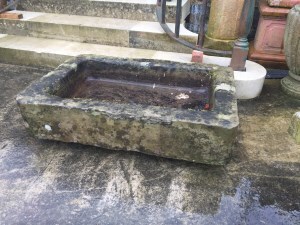 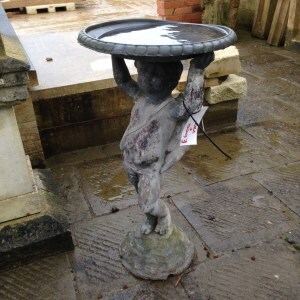 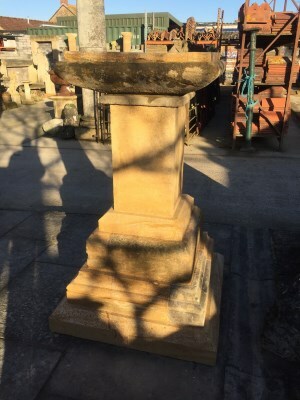 A large Hamstone bird bath standing 54" high with a 25" square bath. 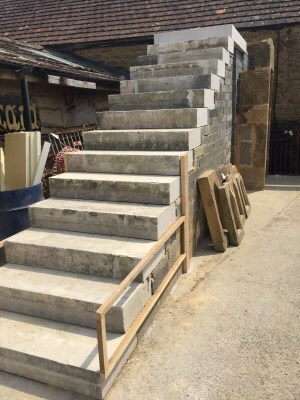 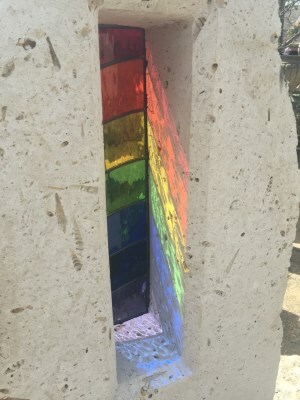 A Portland stone staircase with 14 steps each being 7" high and 45" wide leading to a large platform 61" x 45". 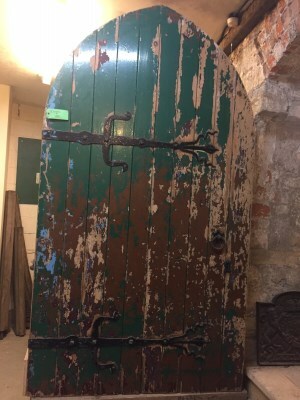 Overall height 98". 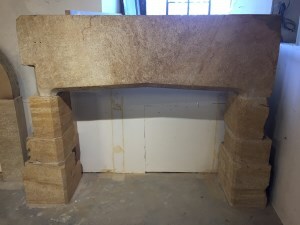 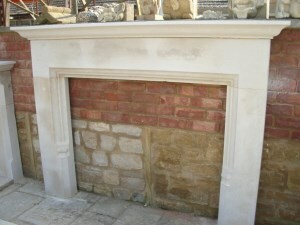 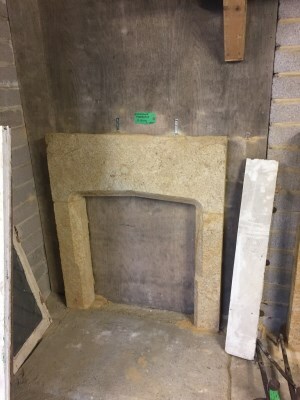 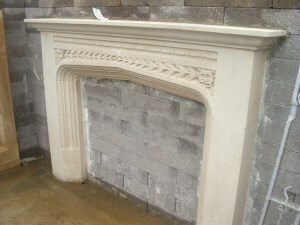 Bath Stone Inglenook fireplace with large oak beam. 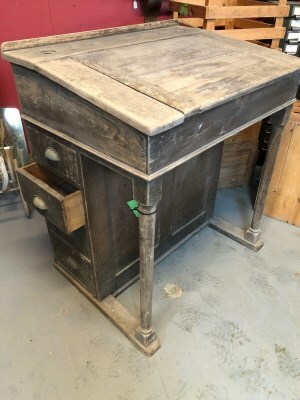 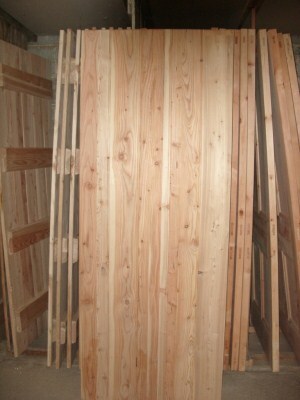 Overall height 81" x overall width 111". 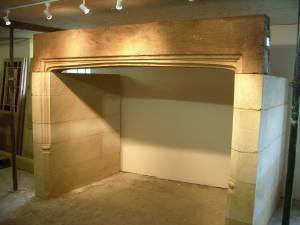 Internal height 64" x internal width 91". 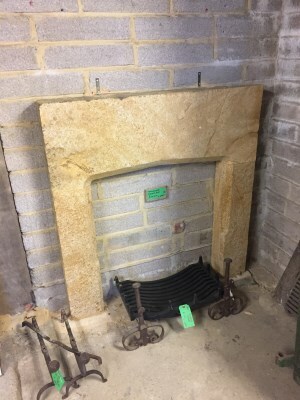 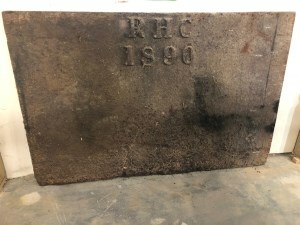 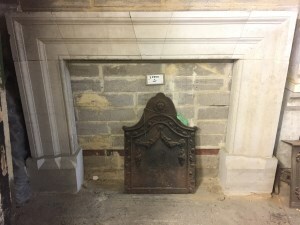 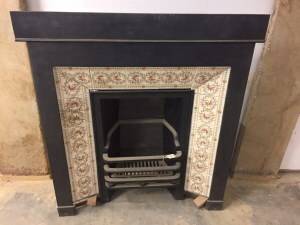 Depth of fireplace 60", height of beam 19"
Oak Fire Surround 59" wide x 44" high with an opening 36" x 36"
An old cast iron fire back with markings R H C 1890 36" x 23"
Ready to enjoy a glass of wine on those balmy summer evenings this marble top table on an old sewing machine base. 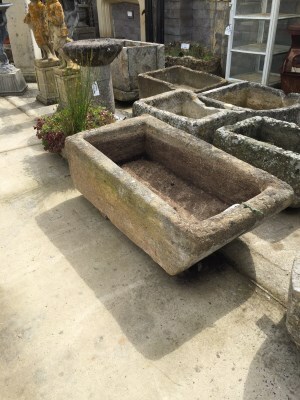 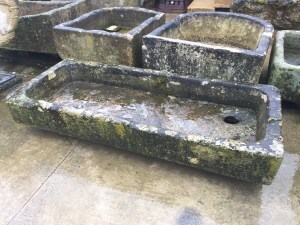 Top size is 45" x 30"
Hamstone garden trough 31" x 22" x 12"
One of a pair of grand Hamstone entrances 102" high x 60" wide. 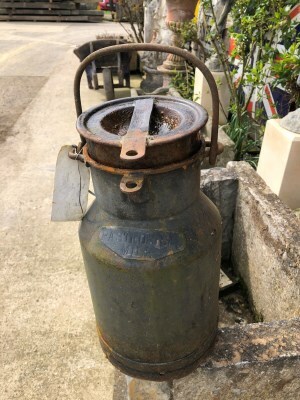 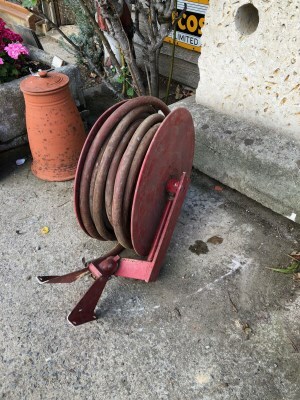 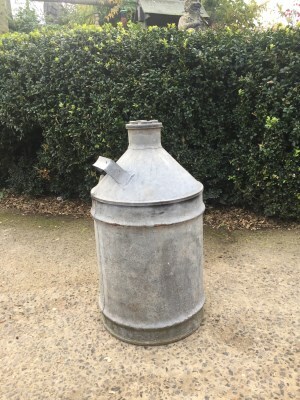 A small milk churn with carrying handle. 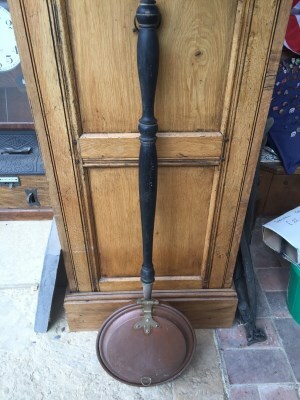 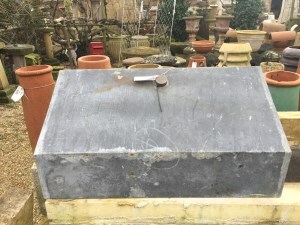 15" high with embossed plate "Pasteurised Milk"
A pair of heavy blacksmith made gates 96" x 40"
A set of three massive Staddle Stones standing 36" high x 22" x 18" on the base and 11" square on top. 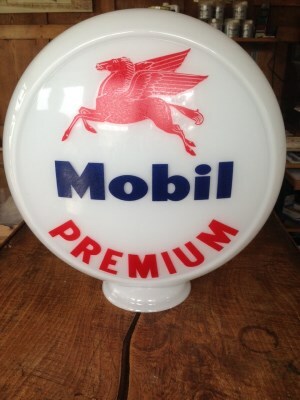 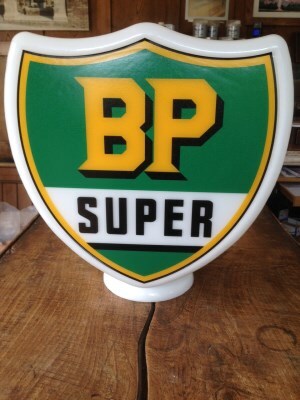 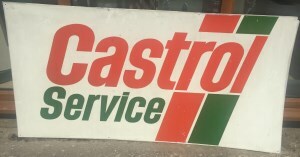 A large Castrol service sign made from plastic 60" x 30"
Rustic Pine Fire Surround 60" wide x 46" high with an opening 36" x 36". 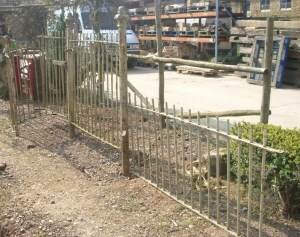 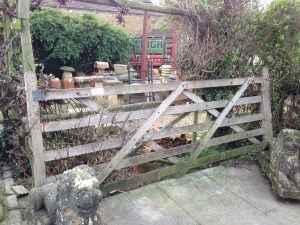 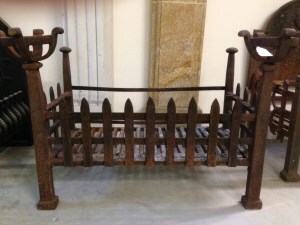 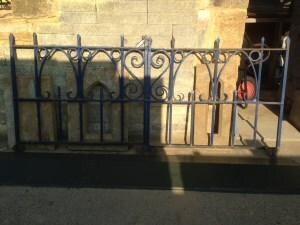 A Kissing Gate with large side gate attached and a length of 5ft 6" railing. 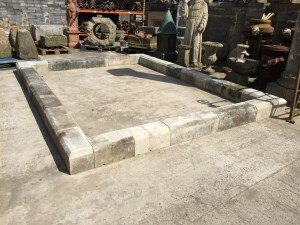 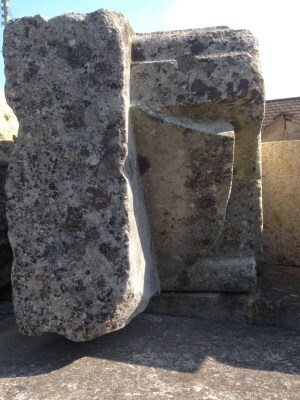 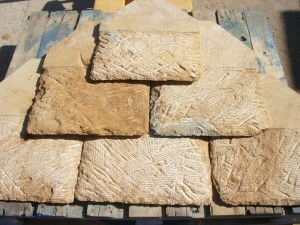 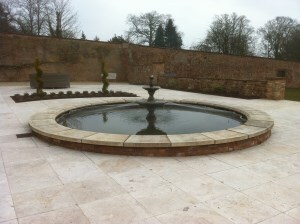 Replica Pool surround 86" square but can be made larger with additional stone. 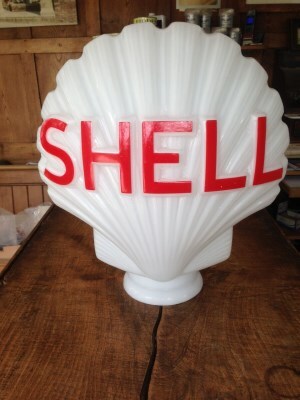 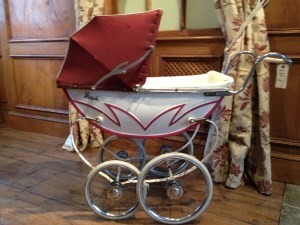 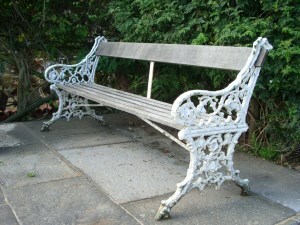 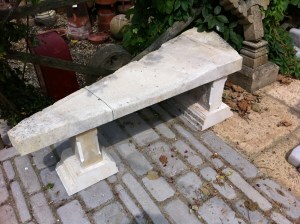 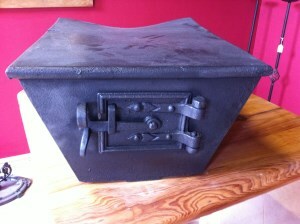 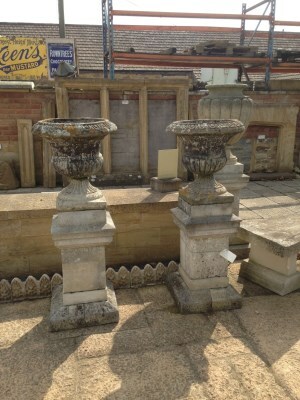 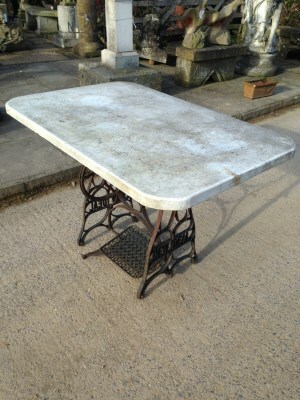 Sections are £50.00 + vat each. 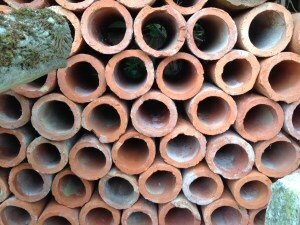 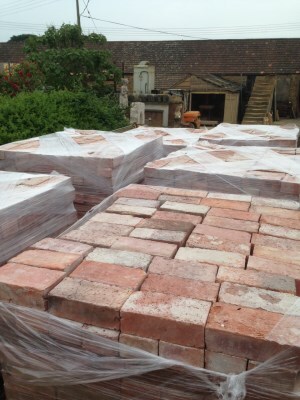 Bricks can also be supplied. 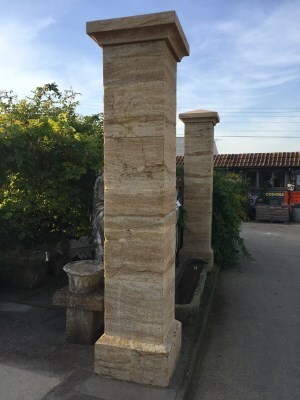 A pair of Portland Stone columns standing 14ft high. 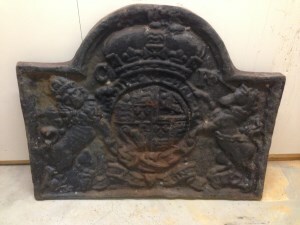 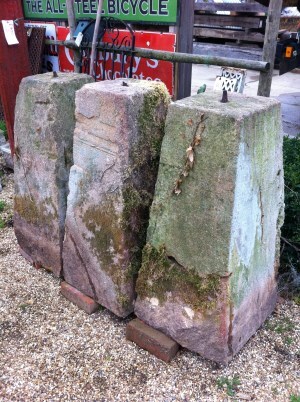 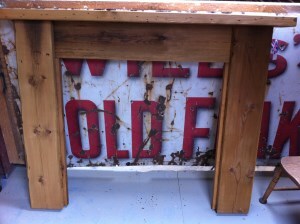 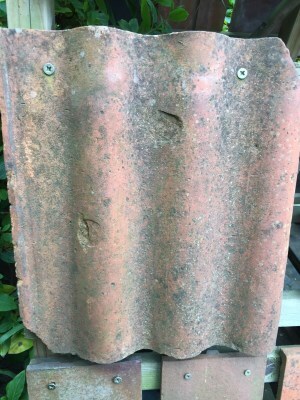 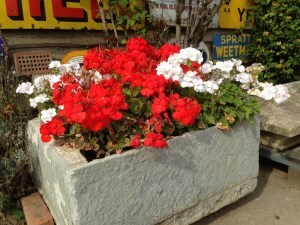 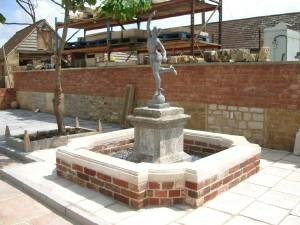 From an old masonry yard in Southampton and believed to be reclaimed from a demolished civic building. 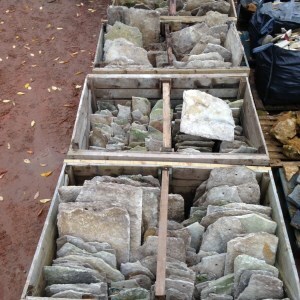 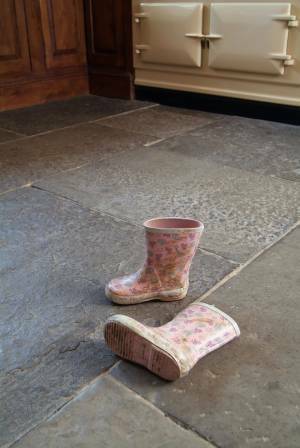 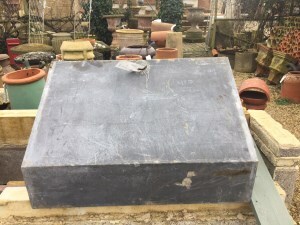 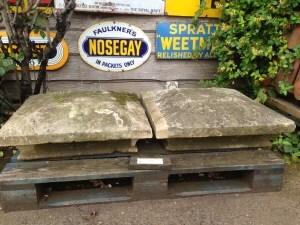 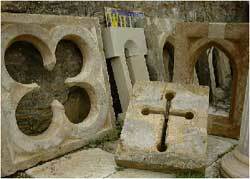 Replica Blue Lias Flagstones made by ourselves in more than 50 different sizes. 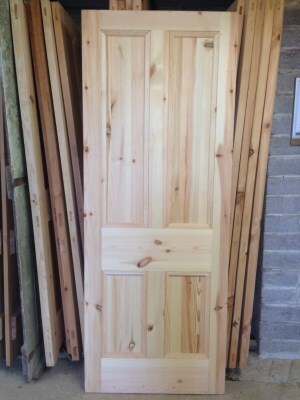 £43.00 + vat per sq yd. 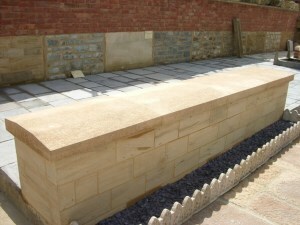 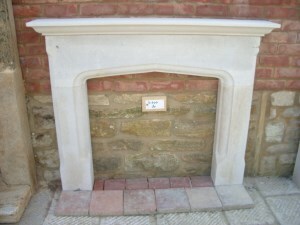 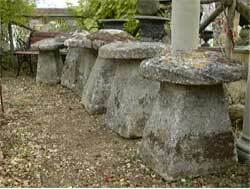 Purbeck and Hamstone also available at £48.00 + vat per sq yd. 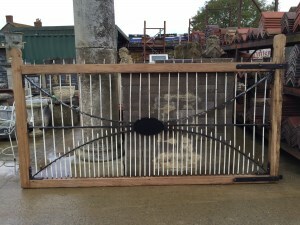 This solid oak 10ft field gate will enhance any gateway. 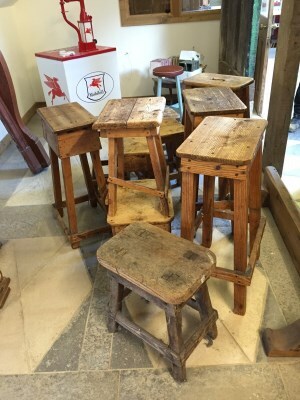 For the woodworkers out there. 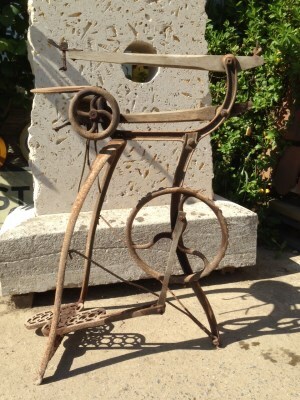 A treadle operated fret saw. 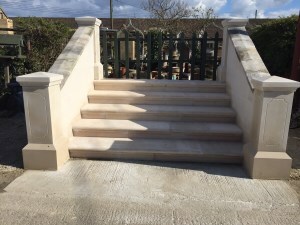 Portland Stone staircase with winders. 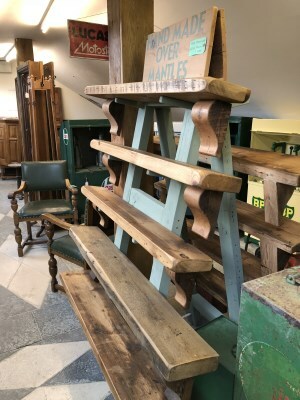 Thirteen treads and a top platform 8ft high with 48" wide steps. 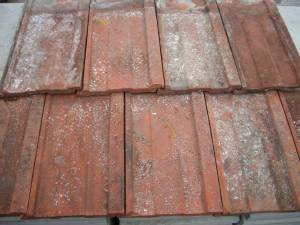 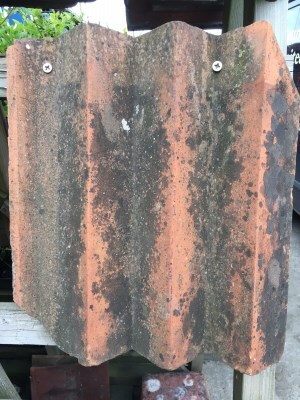 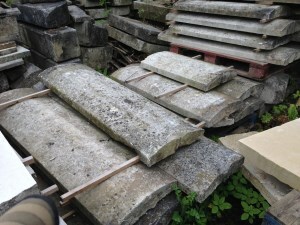 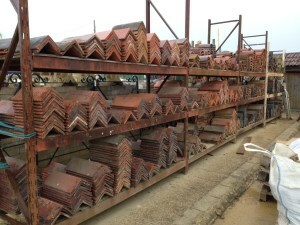 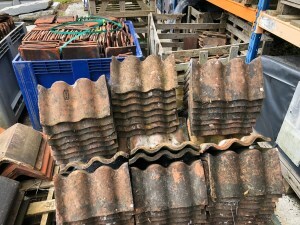 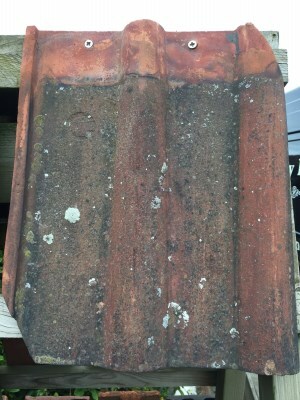 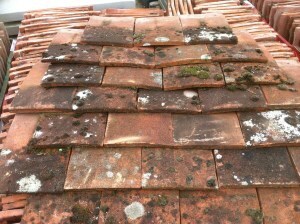 A selection of large and smaller Purbeck stone roof tiles. 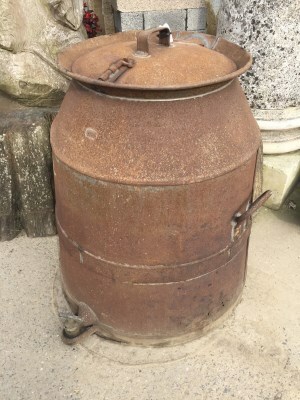 Around 10 tons. 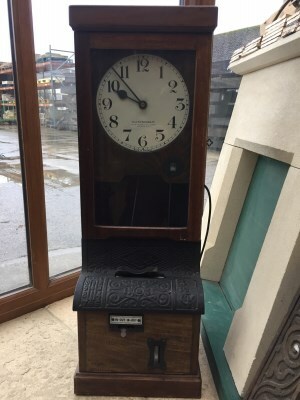 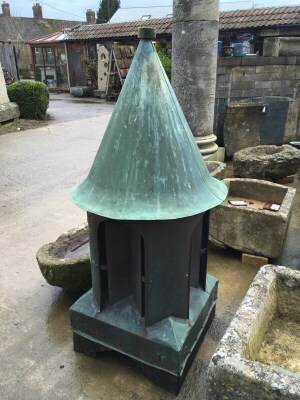 A Cupola made from copper standing 51" high x 20" x 20"
An electric clocking in clock in full working order from a local glove factory. 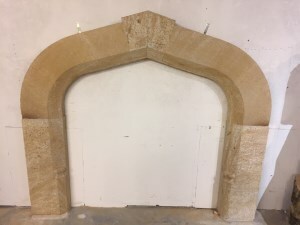 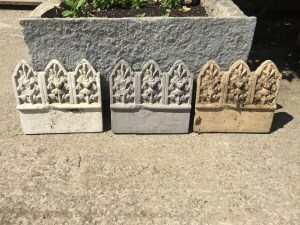 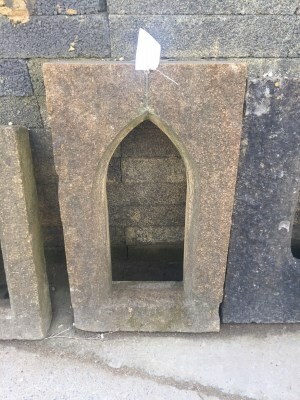 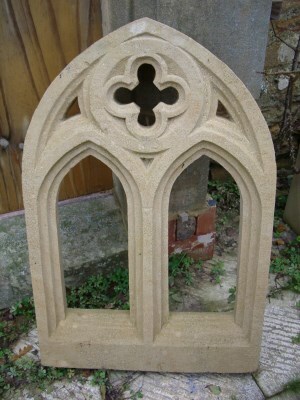 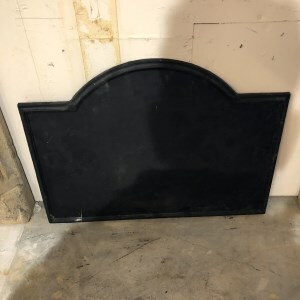 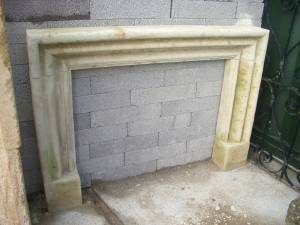 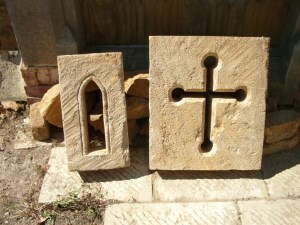 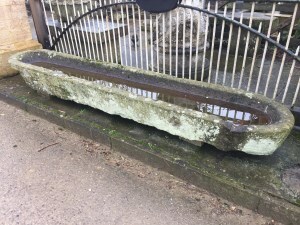 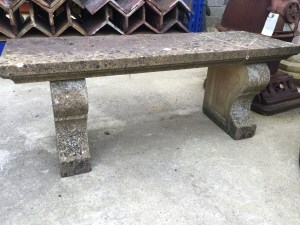 A gothic style Hamstone window 31" x 18"
An old stone trough 48" x 20" x 6"
A long narrow stone trough 89" x 16" x 7"
A large door and frame in painted pine. 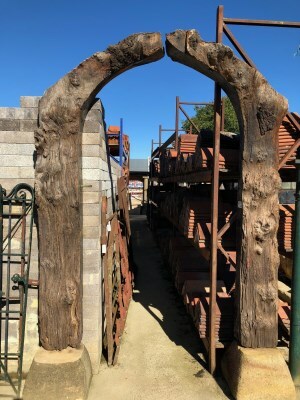 Frame 44" x 90" and door 39" x 87"
A selection of wooden crates 24" x 18" x 16"
A pair of large cast iron brackets 18" x 18"
Replica path edgings in three colours, Purbeck, Blue Lias and Hamstone. 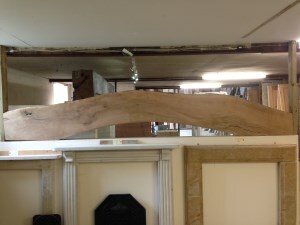 A good selection of hand made over mantles made from reclaimed pine. 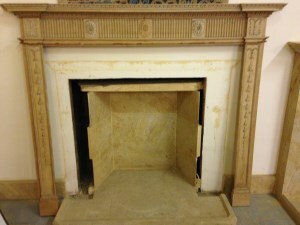 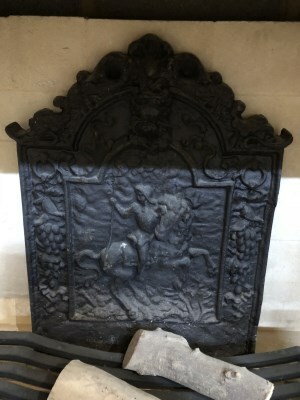 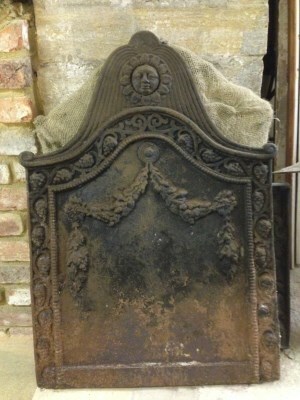 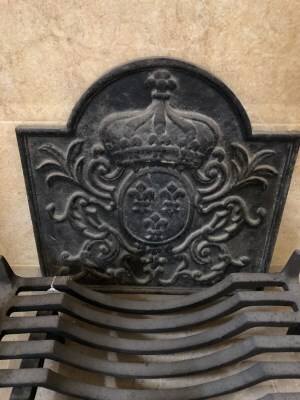 Reclaimed slate from snooker tables approximately 72" x 28"
Cast iron fire back with crown above three fleur d lys. 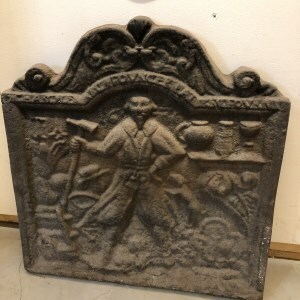 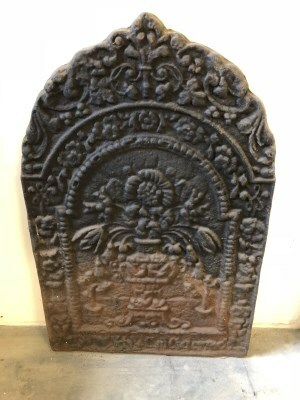 19" x 19"
Cast iron fire back with a man holding a hammer or an axe. 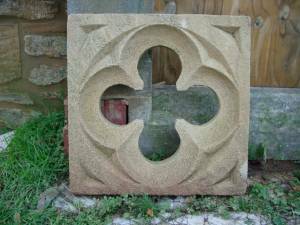 20" wide x 21" high. 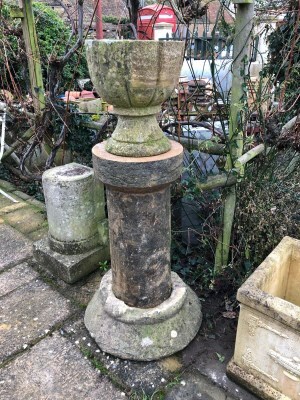 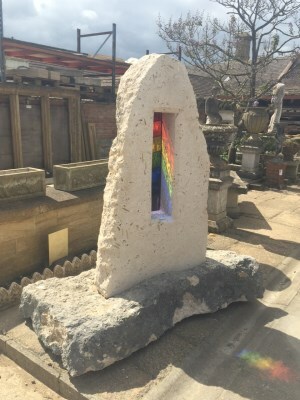 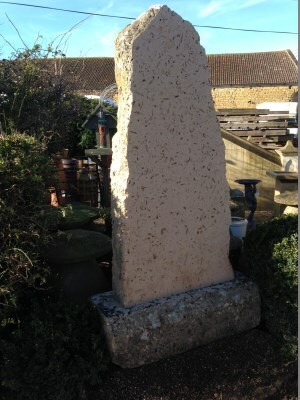 A stone urn 16" high standing on a Hamstone column 36" high giving a total height of 52"